This is my latest "one that got away," a scarce Japanese type card that ended with me as runner-up bidder on eBay. 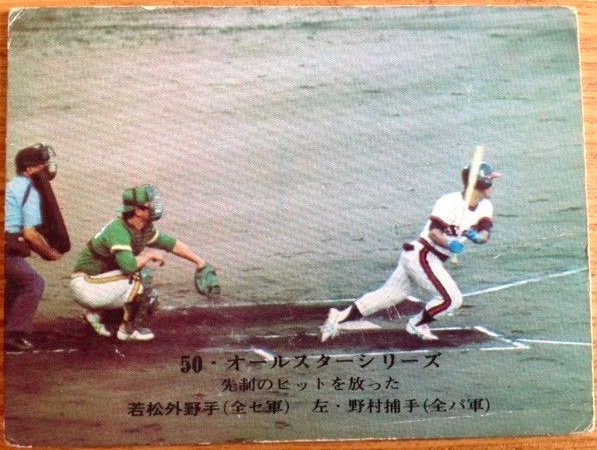 According to collecting expert Rob Fitts and reader Ryan G, this card's from a multi-series set covering Japan's 1975-76 seasons and pictures a 1975 All-Star Game. 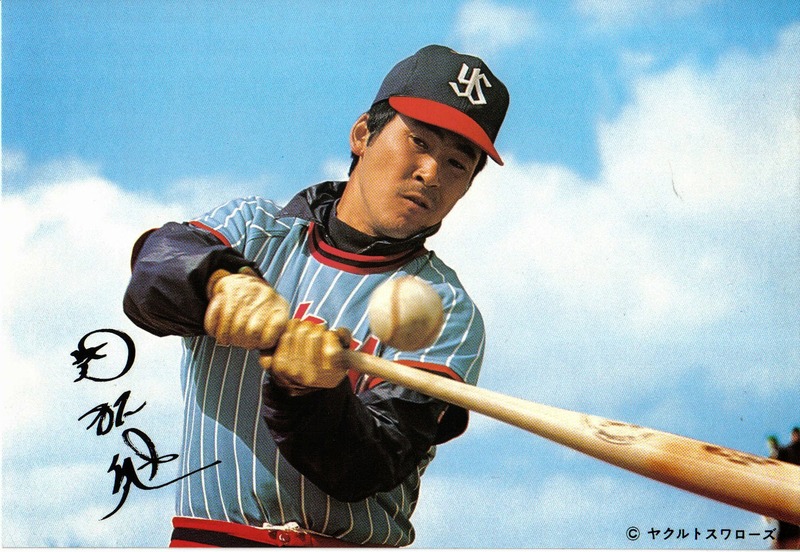 The batter's future Hall of Famer Tsutomu Wakamatsu, who played, broadcast, and managed for the Yakult Swallows franchise. The catcher's another future Hall of Famer, Katsuya Nomura, who was then player-manager for the Nankai Hawks. Here's a 1977 trading card of the sharp-hitting Wakamatsu, as found in a tribute to 2009 Japanese Hall of Fame inductees. The 1975-76 back's titled "Pro Baseball Card 5," followed by what I believe are details about the 1975 All-Star Game pictured on its front. 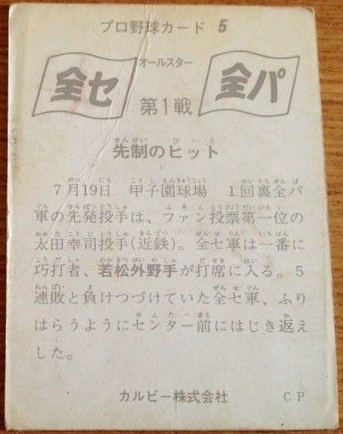 Japan played three such exhibitions that year and this one's dated July 19th (7/19). 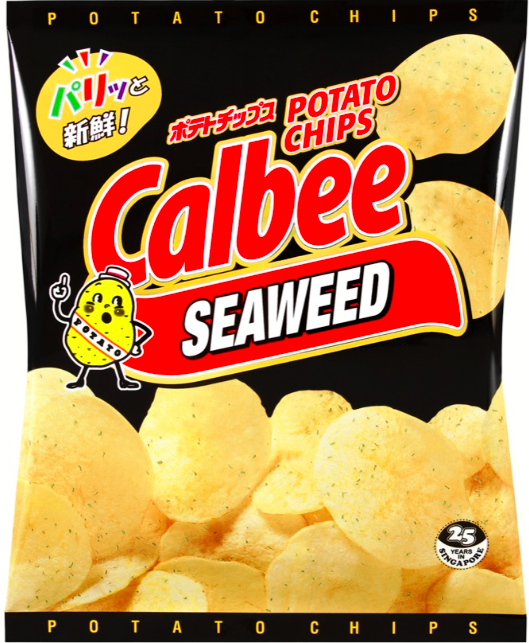 Calbee itself is a food company and packed their cards into potato chip bags like the one above. They printed large sets, some numbering over 1000 cards, but proved so discardable (and localized) that few exist in American collections today. 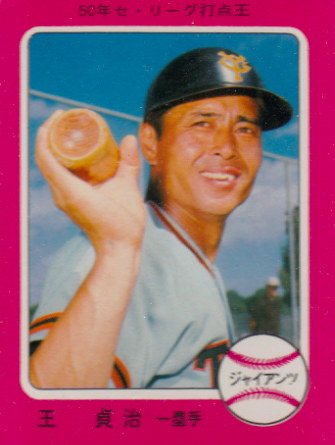 Japanese-Taiwanese slugger Sadaharu Oh's the best-known player from 1970s Calbee sets and often appeared on a dozen cards each year, thanks to their generous set sizes. Former major leaguers played overseas often enough they also pop up in those sets, but I especially enjoyed this custom "1975 Calbee" of Frank Howard by Cards That Never Were. Big Frank barely played thanks to a back injury, but appears on a handful of vintage and retro cards in Japanese gear. Value: This #5 closed at $20 ( $13 bid + $7 shipping). I'll have to track down more Calbee auctions to know whether this is typical for singles. Mid-1970s Japanese issues are obscure (and specialized) enough that setting a real market price is hard to do, so you might have to pay more than expected for specific cards. Fakes / reprints: Sadaharu Oh might be famous enough to reprint or fake, but it'd be easier for a counterfeiter to stick with more familiar American cards, so the risk seems low. You're pretty close on your/his ID - it's actually from the 1975-76 set, and it commemorates the 1975 All-Star Game. (It was issued in 1975.) The "book value" of the card is $25, though actual sales can be all over the place as you mention, and that value is supposed to be mint. Living in Japan, if you have a list of cards you're specifically looking for I can keep an eye out for them for you and we can work out a trade or sale. Let me know! Thanks Ryan, I'll update the post dates! Calbee cards are pretty new to me, so a #5 from any their vintage sets would be great. Let me know if any turn up and we'll work out a deal. I'm the guy who outbid you on this card. From what I see on Ebay, most mid-70's Calbee cards sell for $10 or less unless they are of Sadaharu Oh, Shigeo Nagashima or a "big" name American like Charlie Manuel or Davey Johnson. Those might be more in the $20-$30 range. I want to stress that those are the selling prices - that doesn't mean that folks don't list them at higher prices. I bought a bunch of these cards from the seller of this card and I think I averaged around $5 per card. This particular card was one of the more expensive ones (mostly because you bid on it also). Because I bought so many cards from him (~40 in all), the seller gave me free shipping so the card really was only $13. When I was in Japan last year I was surprised at the availability of mid-70's Calbees at low prices. I was able to get a 1973 Sadaharu Oh for $20. It wasn't mint but it wasn't in terrible shape either. I can't recall exactly what I paid for the other cards I picked up but I would be surprised if any of them were more than $10. Obviously Ryan can gave you a better idea of the prices (and he's had some excellent posts lately about mid-70's Calbees). 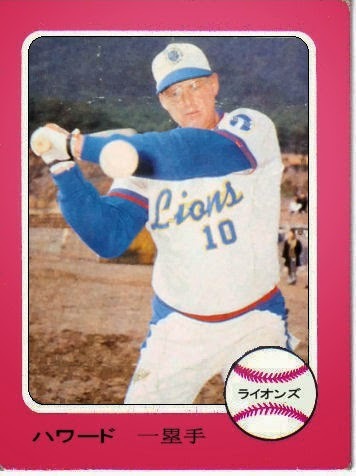 Frank Howard actually had a card in the 1974 Calbee set - it's pretty rare and pretty expensive. The custom "1975 Calbee" card uses the picture from that card. Another major Japanese card company, BBM, has had a couple cards of him in recent historic sets. In the usual condition I find Calbee cards from the 1970s through 1980s, they start as low as about $1, with singles in stores usually running $2-7. Popular foreigners are rarely available but generally they're much cheaper in card stores than you'd find on eBay. I'll keep my eyes open because I've been looking through Calbees anyway. Thanks for even more info, NPB and Ryan! No hard feelings about the outbid, it's just good to find a new (potential) card for the type collection and know what to expect for future buying. I'll update the note about Frank Howard's custom card, too. Went I visited Japan in 1991, pay phone "cards" seemed more widely collected than baseball or other trading cards. With the advent of cell phones, have phone cards basically disappeared? I don't see phone cards anywhere anymore. I do run across older ones from time to time, but like America, the 15 minutes of fame for the phone card is up. It seems like Korea might still be big on phone cards, though it was tough to tell in the limited time I was there. Stamp and coin shops are certainly plentiful, though I wasn't able to find a single baseball card store. BBM was brand new in 1991, and from what I understand collecting wasn't anything like it was in the US. As the company established itself it was able to issue more and more sets and the card hobby started to grow. By 2001, Ichiro was big in the US and I think that's when the real baseball card market truly exploded here.